While my ski buddies from last week in Ischgl were revving up for the end-of-season bash up the mountain, the highlight of which is a concert by The Killers on Sunday (1 May), here in Surrey some of us were enjoying a different kind of Austrian music. My sister, Teresa (see ‘About’), and her husband threw a party today to celebrate her 40th birthday, their 11th wedding anniversary and the royal wedding. I’m afraid that in my excitement I filmed it the wrong way up, and it’s very dark, but hopefully you get the idea. 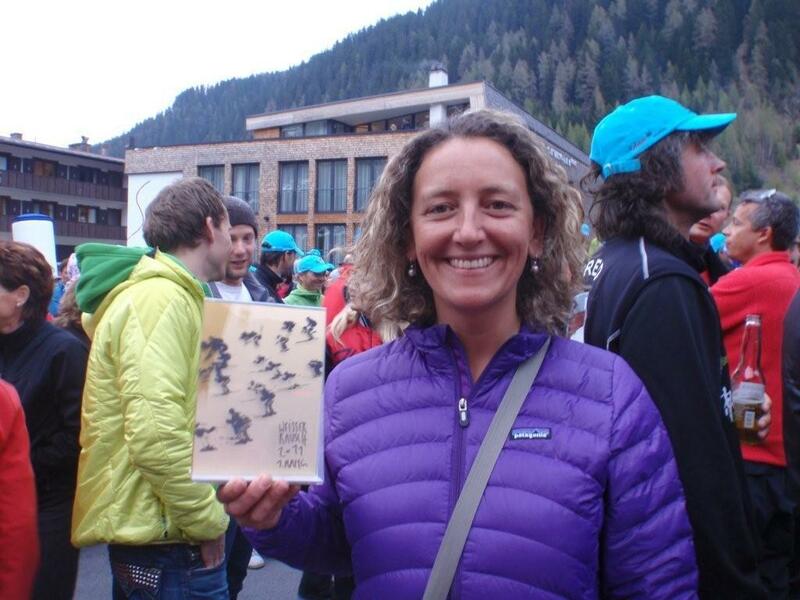 The wild man next to Teresa is a keen skier that some regular readers may recognise: any guesses? I assure you his downhill is just as accomplished as his dancing. You may also be able to spot Wills and Kate among the guests somewhere. Teresa took up the accordion aged around 10 – partly so she didn’t have to continue with the violin, but mainly because she adored mountain music. As readers who know us and past customers of More Than Skiing (see ‘About’) will know, both of us relish the sound of a jolly good yodel and the swing of an accordion, whether Austrian or Swiss. From the age of three we hummed along to mountain music nearly all the way from Le Havre to Anzere and back twice a winter, thanks to our parents’ brilliant (I mean it!) taste, although we nearly died of embarrassment when they once got up to dance – at lunchtime! – to a band in Zermatt when we were eight or nine. Teresa can play lots of songs like these, plus a few Russian folk numbers – maybe I will record a few more to see all the mountain music-lovers among you (there must be one, surely!) through summer. In fact if you are a fan, you’re in luck: we’re planning to go to a Jodlerfest in June so there will be footage and pictures aplenty in a couple of months. Below is a link to the results – as you can see there are lots of categories! 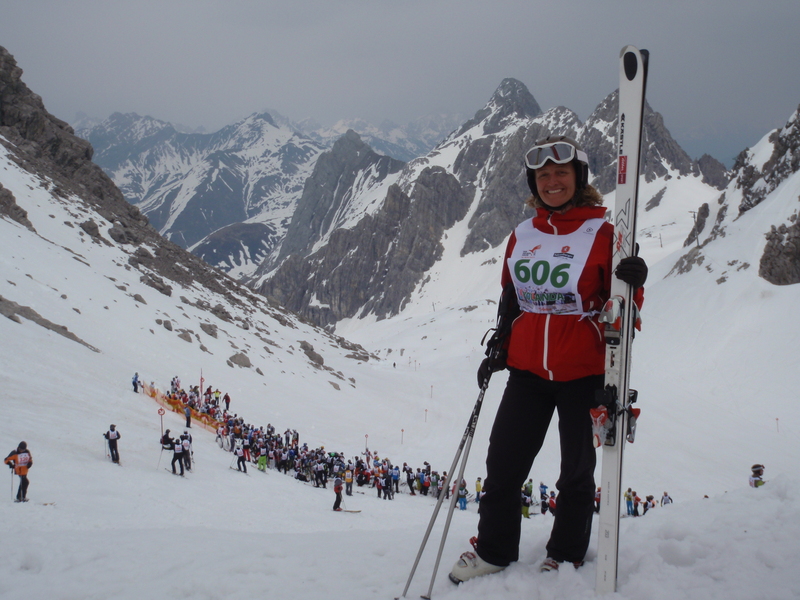 I didn’t think there was an amateur ski race tougher or scarier than the Inferno (see previous posts), but I’m pleased (well, sort of) to report that I’ve competed in one today. 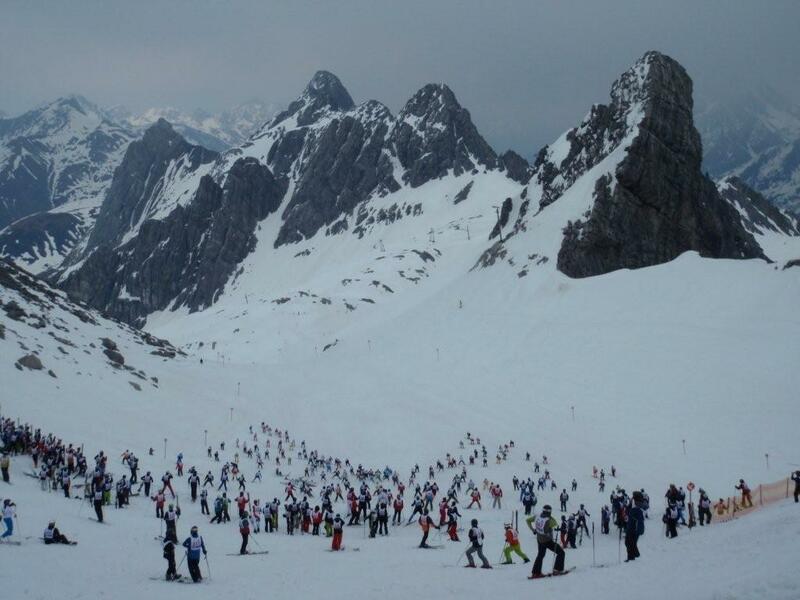 St Anton’s Weisse Rausch, an end-of-season downhill staged on an end-of-day slush-field from the top of the Valluga to the town, has superseded Muerren’s January downhill for extremeness, exhaustion and exhilaration. It begins with a mass start – or rather three mass starts. 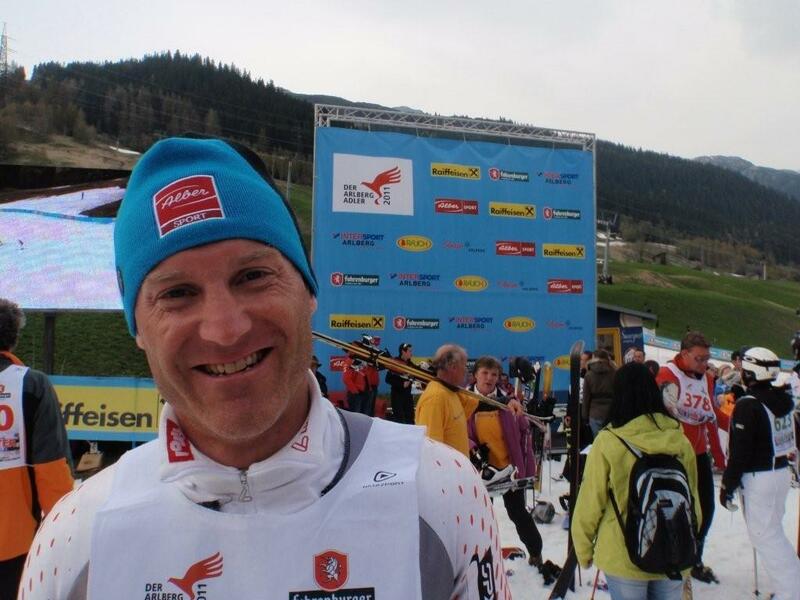 First to set off, at 5pm, are the men born in 1973 or later, plus some leading contenders who, through good past results, have earned a place in the first batch. Ten minutes later the older men set off. This covers about 500 of the 650 competitors. Then it’s the turn of the women, snowboarders, big-footers, bladers, telemarkers and ski-bobbers (remember the snow bikes?). 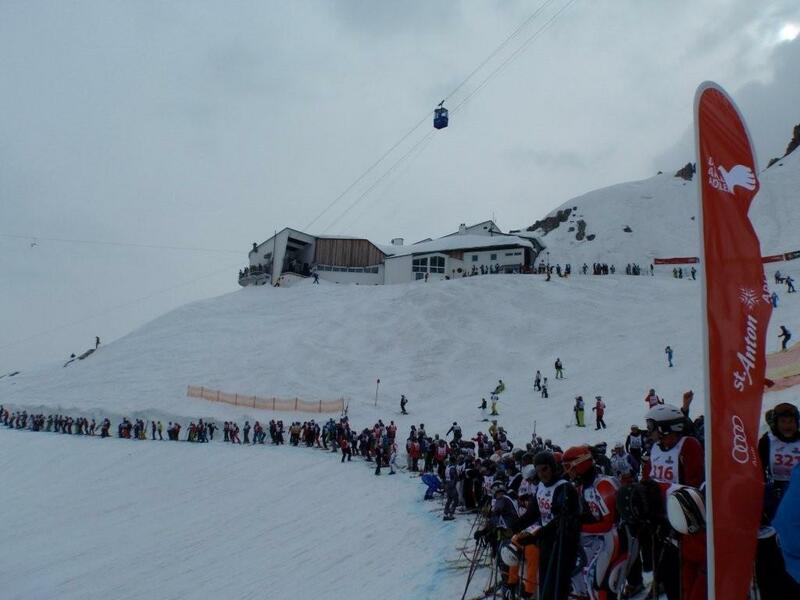 Very sadly, one racer, a 48-year-old man, had a heart attack during the race, about half way down, and could not be saved. So the mood at the prize-giving was sombre, and the official race party was cancelled as a mark of respect. At least the poor chap died doing something extremely exciting, and let’s hope his last thoughts were happy ones. Among the most entertaining prize-winners was a snowboarder who won his age group – as the only person in it – despite being easily the slowest finisher. This chap took an almighty one hour and two minutes: the winner, Paul Schwarzacher, took around eight minutes. Dozens of people won prizes, thanks to a generous number of categories – and as you can see from the picture even I managed to take home something for the mantlepiece, as I somehow won my age group. 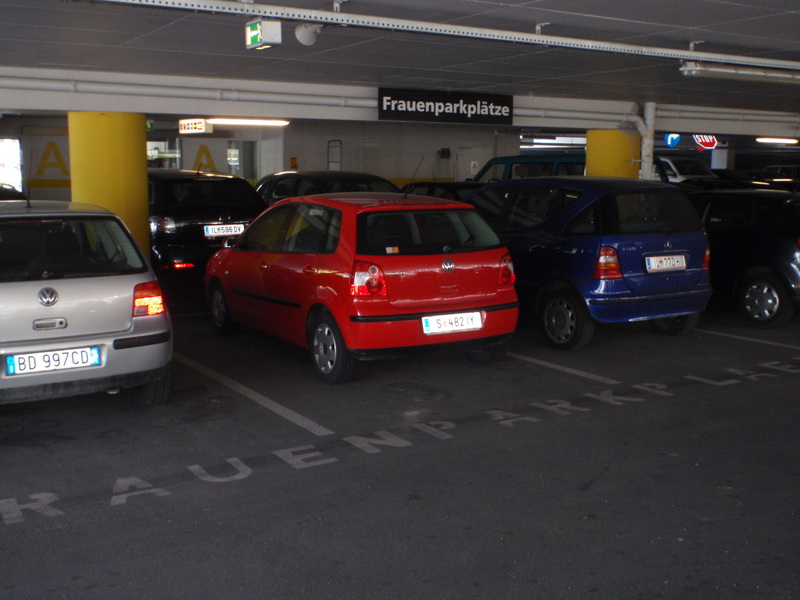 …I will be very unpopular with two English regular visitors to this Austrian resort who do not want other Brits to over-run the place. But as it seems to be such a fantastic spot, and as I think it will take several generations for Brits to gravitate away from Val Misere anyway, I’m going to spill the beans. 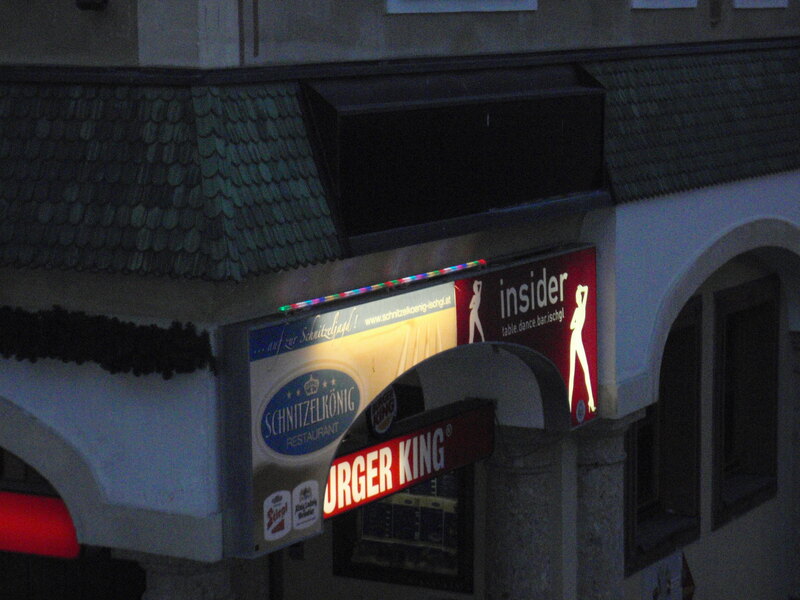 Mention Ischgl, and unless people are already fans, or have been there for one of its mountaintop concerts, they will either not have heard of it or will have been put off by its reputation for slight seediness (for instance, there is a girlie bar in the basement of Burger King… although in fact I’d be more put off by the presence of Burger King). It’s quite easy to avoid these bars by the way – they are identified by some sort of heart or red silhouette outside. The things that have impressed me in 36 hours here include the brilliant conservation of snow, the tiny numbers of people going off-piste, the amazingly fast, comfy and efficient lifts and the attractive, cheerful town. 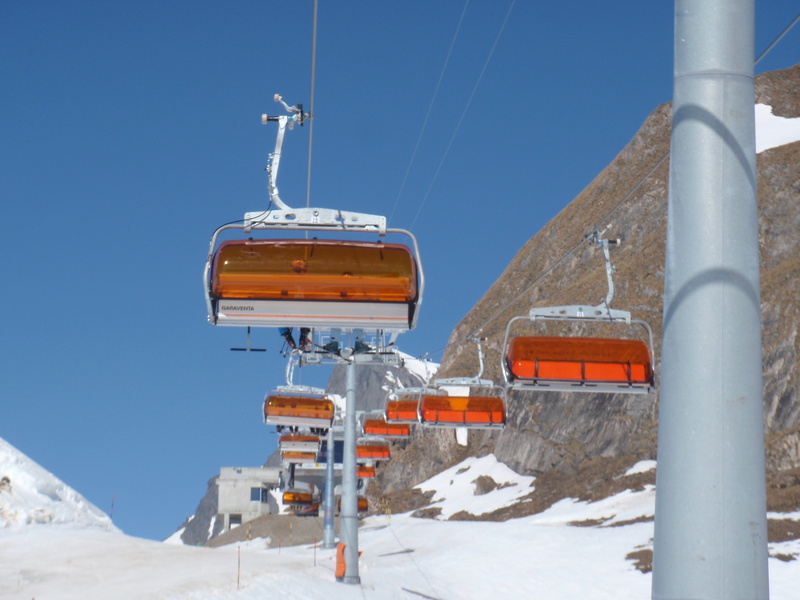 These pictures show how the piste control has managed to keep the home runs open – two to Ischgl, one to Samnaun on the Swiss side – in the face of very little snow indeed. Today we skiied off-piste all morning on the south-facing side, in Switzerland, with the brilliant Ski Club of GB leader Jim Costelloe, and barely saw a soul. We sat on speedy, cushioned chairs and we never queued. 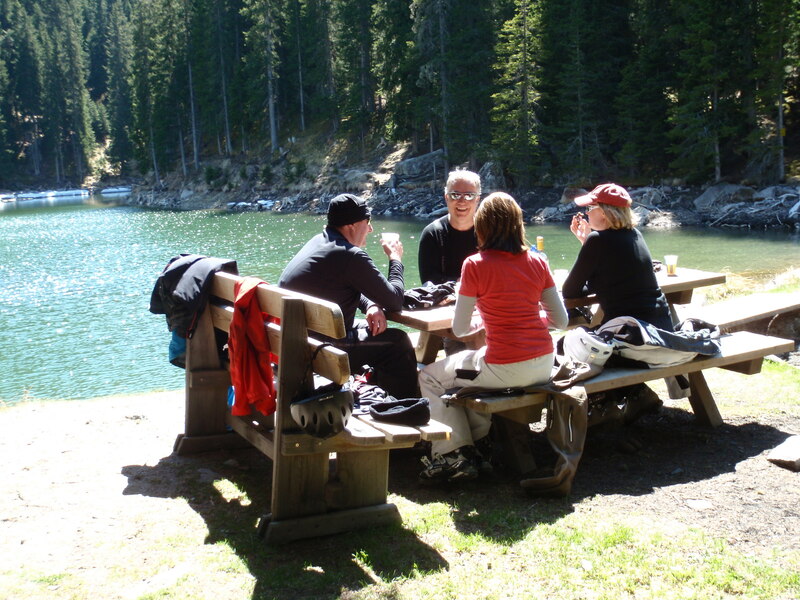 We had a picnic lunch by a lake and skiied all the way back to town at 3pm on remarkably nice snow – right down to 1,400m. I think these pictures speak for themselves so I won’t go on about it. And… shhhh! … it’s only 45 minutes’ drive from St Anton, where we have just arrived, as I’m racing in the end-of-season Weisse Rausch downhill tomorrow. I’m sorry to say that with all the best intentions I did not succeed in keeping the pre-race day alcohol-free: we had a schnapps at 11am in Samnaun in order to qualify for a free shuttle bus back to the lift; at our picnic someone brought wine, and although we avoided the Mooserwirt (see previous post), it seemed a shame not to celebrate our fantastic day with a red wine spritzer in the sun in the early evening. It’s time for my second-last ski trip of the season, a six-day, last-minute break in Austria. My excellent friend, Kirstin, and I booked flights to Innsbruck without planning any accommodation, apart from a couple of nights in St Anton, where I’m doing a race called the Weisse Rausch (more on this in future posts). 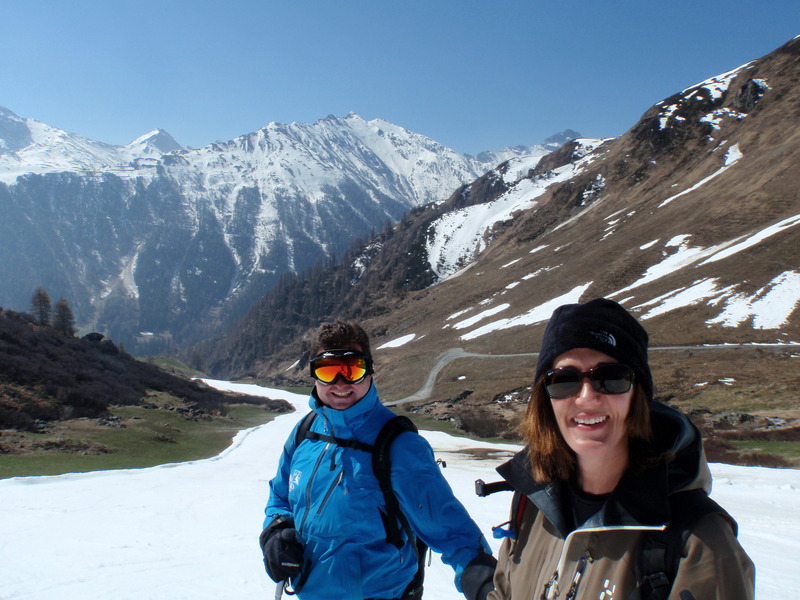 We hope to find spring snow, sun, apres-ski and maybe a bit of proper exercise walking uphill on a two- or three-day tour. Has anyone seen this in other countries? 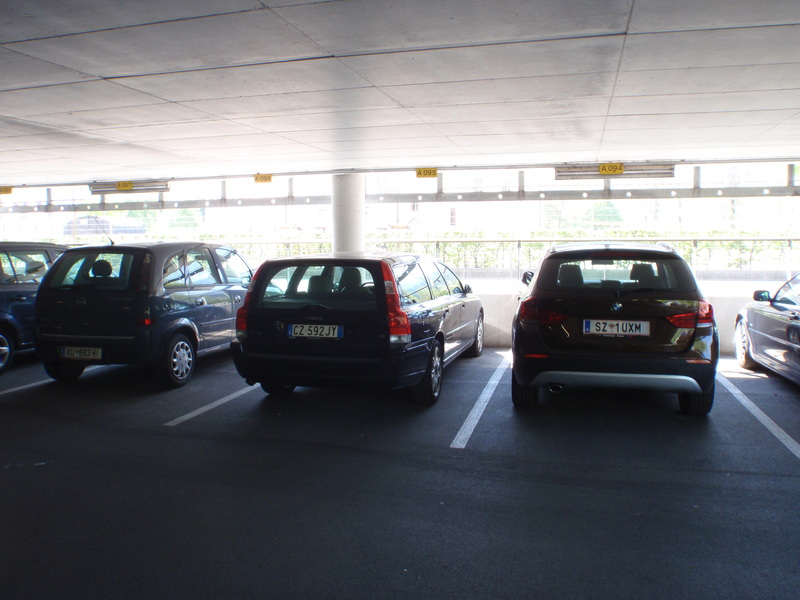 What we did not expect to find was what you can see in these pictures: at Innsbruck Airport this morning when we were passing through the car park to collect our hire car (upgraded from tiny Panda to massive Astra) we discovered this brilliant set of parking bays. Frau means woman. Platz means place. 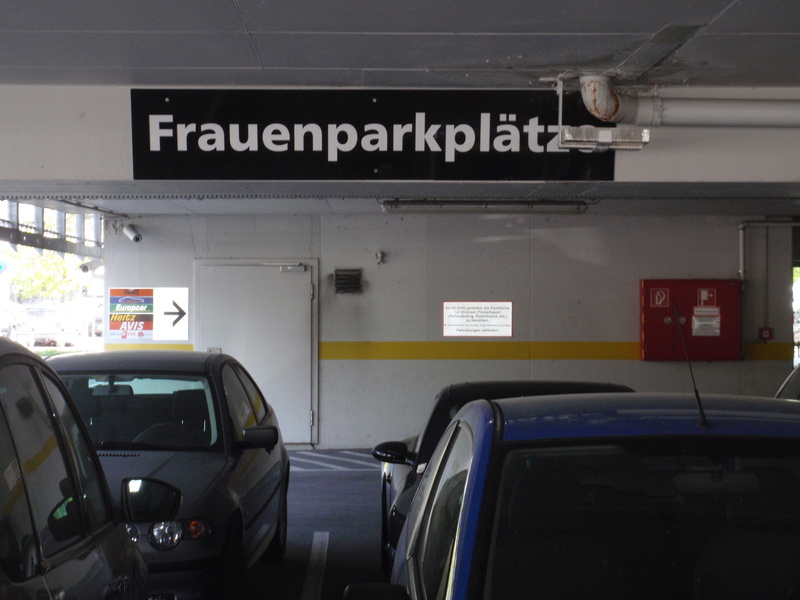 In Innsbruck Airport, there are special women’s parking spots. Annoyingly we did not get to test out or to measure the super-wide berths as I am not carrying my tape-measure. But I took pictures of the unisex places as well as the ladies’ ones, so you can see for yourself. 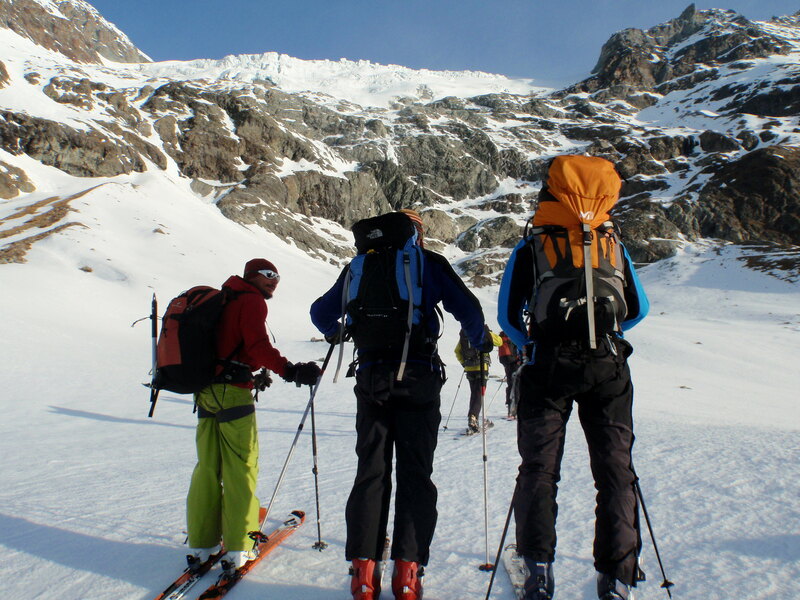 Ski touring, the idea is to take as little as possible – after all, it’s you that has to carry it. 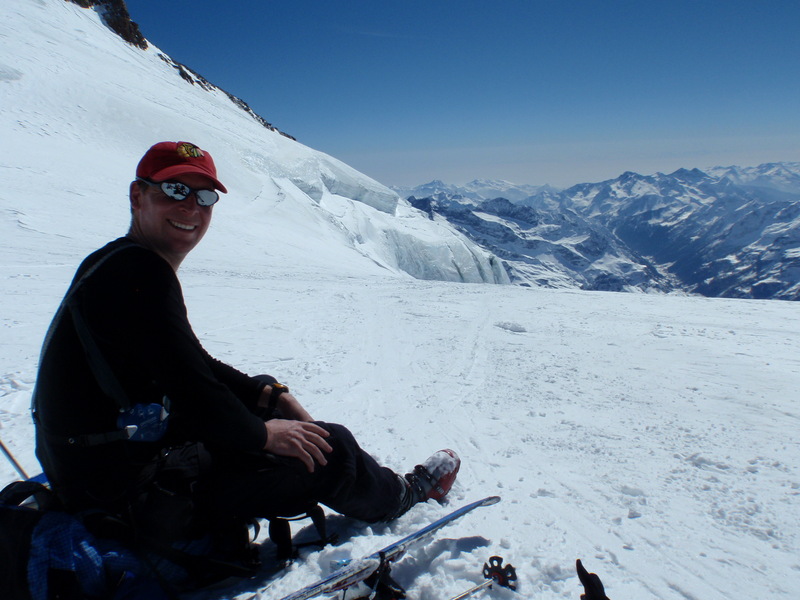 On the tour from Alagna to Zinal at the end of last month (see previous posts), three of us – including me – had reasonable well laden rucksacks: one of my companions even carried a pair of jeans and a shirt for five days. The guides, despite carrying extra rope and all sorts of bits and pieces of climbing hardware, travelled the lightest of all of us. That – I think – is it. The optional kit that proved most essential, which I would never leave behind, were Compeed (used by the others more than me), extra ski socks (I wished I had taken three pairs), the down jacket (for going out to the loo in the night as well as for wearing in the hut and under my shell jacket sometimes) and the fleece gilet (for climbing, worn over one base layer). The kit I did not use was: spare batteries (for headtorch and transceiver: I would take fewer next time); lightweight fleece (not needed now I have a down jacket) and my book (these huts had plenty of reading material – but not all do). Bulkiest in comparison to usefulness was my camera charger – a horrible weight of wires. I didn’t use the tea bags, but I have done on previous trips – it’s far cheaper to buy hot water in huts than tea. I didn’t use the goggles, but we were lucky with the weather. I could have managed without an extra cotton top to wear in bed, and my tracksuit bottoms weren’t essential. But in the end I did use most of this kit. Next time, extras I will bring are salami sausage and hard cheese – great to eat and to hand round when you stop for a breather – although I was surprised to find that my strawberry shoelaces (some sort of Haribo concoction) were a hit, too. Mike Crompton from Zuba Ski, whose excellent company organised last week’s tour from Alagna to Zinal, made this short film. I think it shows even better than words the wonderful time we had – and I hope it will encourage others to have a go at this fantastic sport.